If you are looking for the Best Raspberry Bread Recipes, you have found them here! Recipes for homemade quick breads and loaves (self-rising) have become very popular. Not only are quick breads easier to prepare than breads made with yeast, but they are also much quicker to prepare due to the fact that there is no "rising time" to factor in during preparation time. Quick breads are leavened by baking powder, baking soda, steam, or air - instead of yeast. Bread made with raspberries can be served for a breakfast, brunch, lunch idea, or for a healthy, tasty, mid-day snack! 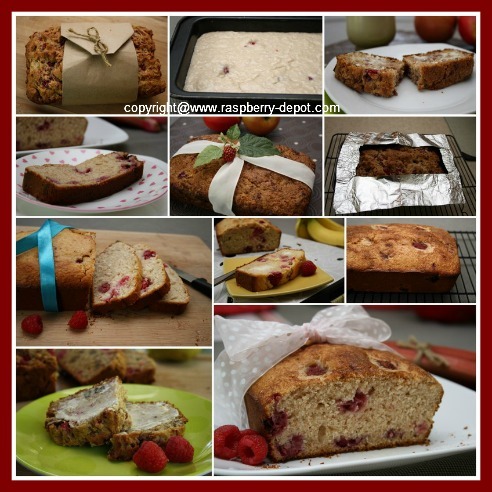 Raspberry loaf recipes include a wide variety of tempting choices, including recipes with nuts, and combining other fruits, (for example; apples or bananas), with the raspberries to make delectable, moist and healthy fruit bread. Quick breads taste especially good served warm from the oven--with plenty of butter! Other favourite toppings for muffins include jam, jelly, or cream cheese. Try raspberry jam or jelly, for a truly unique taste! One important tip to remember when baking quick breads is to remember not to over mix the batter. Over mixing of the batter will result in the texture of the bread being "rough" and "hard". Mix just enough to combine the dry and wet ingredients, even if this means the batter is "lumpy". After baking a loaf of bread, turn it out of the pan and allow the bread to cool on a wire rack. The cooled bread should be stored in an air-tight container, or wrapped in foil or clear plastic wrap to keep it fresh, and prevent it from become dry...but, if your family is anything like ours...the homemade bread will not last long enough to consider how it will be stored! Most recipes for baking bread with raspberries allow for fresh or frozen berries to be used. Let's get baking bread with raspberries!